My Genius Hour - Love. Laugh. Learn. I joined Twitter after going to a workshop at the STA Convention and I have started to build up a PLN of other teachers who inspire me. So far, I have thought of so many things that I want to try.. it is CRAZY! I don't know how I am going to be able to try all of these things in my class. In my Genius Hour, I wanted to start putting some of these ideas into action. If I don't try them now, what will get me trying them. Genius Hour is all about developing ideas and learning new skills and then sharing your thinking on these things. So, learning these things, incorporating these ideas into my classroom will be part of my Genius Hour. One of my first challenges was to try and learn how to use this website. I am hoping to use this website in my class next year to build e-portfolios rather than paper portfolios. I love the idea of students using technology like computers, digital cameras, music and other means to share their learning with each other. I have spent a lot of time lately on some of my own Genius Hour projects: learning Genius Hour, Weebly, Prezi, Reader's Workshop, etc. I want the kids to see that I am learning stuff too. I am hoping that by creating, exploring, discovering things they are passionate about students will then start wanting to learn in their free time. I love that this is getting my kids excited about their learning. We started Genius Hour when I introduced it using a prezi: http://prezi.com/na0nor4_8k2y/genius-hour/ I used prezi because I was interested in learning how this program worked so that I could introduce it to my class as as way of presenting something. 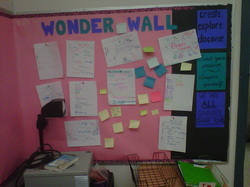 A few weeks ago we started a Wonder Wall and students brainstormed topics they might be interested in. Last week they had to submit a proposal using this form that I created. The rubric was created as a class and this will be how I assess their progress as well as observation. We are having our first Genius Hour session next week. I am hoping that it will be something other than chaos. I know from reading their proposals that they are excited. There are going to be some interesting projects: a smoke machine, building a rocket, building a bird house, learning why Gangham Style has become so popular and then learning the complete dance, making a Canuck poster and researching the players, creating cardboard arcade games like Caine's Arcade (see below where their inspiration came from), glass pyramid, bake sale to raise money for Children's Hospital, etc. This is our Wonder Wall. Students have added their ideas using group brainstorms and post-its. The captions on the side say, "CREATE. EXPLORE. DISCOVER." "Find your passion. Inspire yourself." and "We are ALL geniuses. Share yours." I hope students will continue to create ideas that they will add to the wall throughout the year. I want students to know that they all can be geniuses. All they have to do is try. I can't wait to see what they learn. Excited and a little scared to start. I have been putting it off for a while. Besides learning about Genius Hour and all the things I needed to feel confident enough to do Genius Hour (like prezi, weebly, how to set up document camera to my computer, etc. ), I have also been interested in revamping my silent reading program. I want to do silent reading in my class, but at the same time I want this time to be something that is not just a waste of time. I want kids to actually be reading. I am not sure how to best go about this. I did a self-directed pro D day where I looked into this and did a LOT of research on it and while I find some of it to be good, I don't know if it is exactly what I'm looking for. I don't want to take away the pleasure of reading by forcing them to write about it. I think reading should be enough by itself. So I also read The Book Whisperer and while I agreed with a lot of what is in the book, I just didn't know if I could possibly implement something that big halfway through the year. So I decided to talk to my kids about books and about my love for books and I was so shocked about what I learned. Since then I have been taking some of what I learned from this inquiry of mine and somehow (I really don't know how), I have kids that have started reading. I have boys that want to skip PE to read (and these are my athletes), I have boys that say they choose to read over video games sometimes, and they are starting to talk about the books they are reading. I have about half my boys reading the same series and they are LOVING IT! I don't have all my kids liking reading yet, and I am not sure exactly how to do this, but I have ideas about where I want to go with it. I want to set aside time every week or so to just talk about the books we're reading, I want to recommend books, I want to pick fabulous books to read aloud, and I want to share my passion for books rather than not talk about it. Right now, my heart still sighs each time I hear, "Ten more minutes! Please!" when I tell my kids to put their books away! I have really been trying my best to incorporate technology into my teaching. We received a tech grant this year which meant each class received an iPad, projector and Apple TV. Because of this, one of our school goals revolves around the use of technology. As a result, I am trying to take these new tools and use them to make my lessons more interesting and give my students more opportunities for choice in how they present their learning. I have written a blog post highlighting the ways I am using technology, but I wanted to also say how this is my own GH. Through joining Twitter and participating in Twitter chats or reading posts from other teachers in my PLN, I have discovered heaps of things that I want to try in my classroom . I am starting to gain confidence in using technology. At first I was scared to even use our new school iPads as it seemed easier to just not use them, but I have since learned that just because I do not feel entirely comfortable using them yet, doesn't mean the kids don't know how to use them. After all, my students basically showed me how to use my iPhone and my iPod when I got them. They know how to use this technology way better than me. I think it is great to put them in the teacher seat where they are showing me their strengths and able to help each other and me. I tend to learn the basics of a program like Weebly, Evernote, Prezi, Book Creator, and then I just hand it over to them. Students are so resourceful, and smart, they know how to figure it out. It also allows different students to shine, which is a nice side benefit.